Available to those who have attended Vajrayana Seminary or Sacred World Assembly. Please include the year you attended in the comments section of your order. This is an edited transcript of talks given by Vidyadhara Chögyam Trungpa Rinpoche at the eighth Vajradhatu Seminary, part of an eleven-week training period of intensive meditation and study held at Lake Louise, Alberta, Winter 1981. 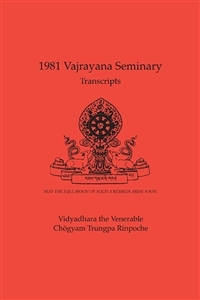 This searchable eBook edition of the 1981 Vajrayana transcripts is one of twelve individual volumes. The complete Collected Vajradhatu Seminaries: Vajrayana, 1973- 1985 eBook is available for $250. Our eBook instruction sheet will help you to prepare to download these restricted files. Downloads will be delivered during the first or third full week of the month.